CT8901-7 is a high temperature water-based phenolic coating composition. 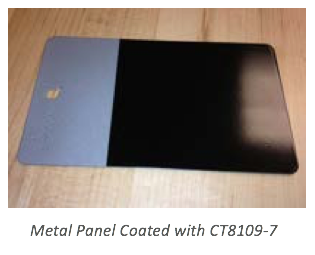 This coating provides a very hard, abrasion resistant, and chemical resistant film at constant temperatures up to 400°F with intermittent peak temperatures of 600°F. The final coating provides a very thin coating with a slick surface. CT8109-7 is used for applications where an impermeable sealing surface is required. This coating has been used in applications related to di-electric, chemical corrosion resistance, and antifouling. The coating is applied with proprietary spray equipment, and then requires a post cure heat treat at 400°F.